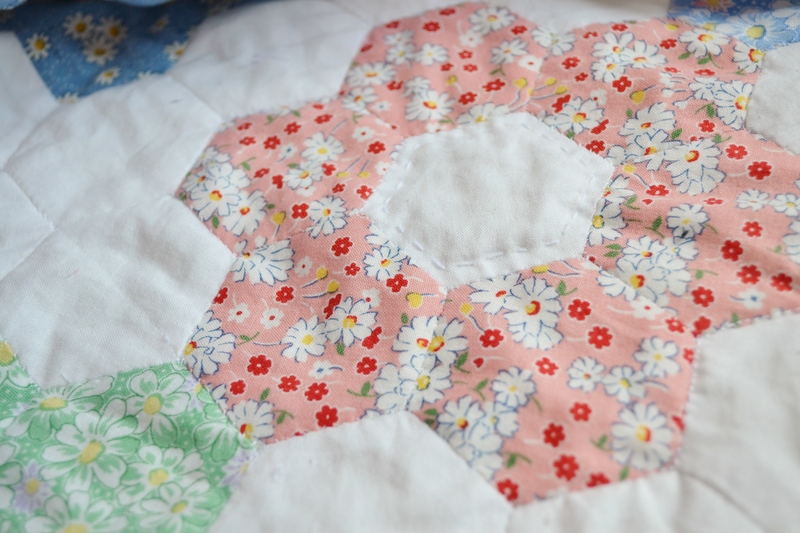 It’s all very exciting because my hexie quilt, the one I was supposed to have finished the same time the World Cup finished is almost finished! The past week I’ve been battling with the hand quilting. 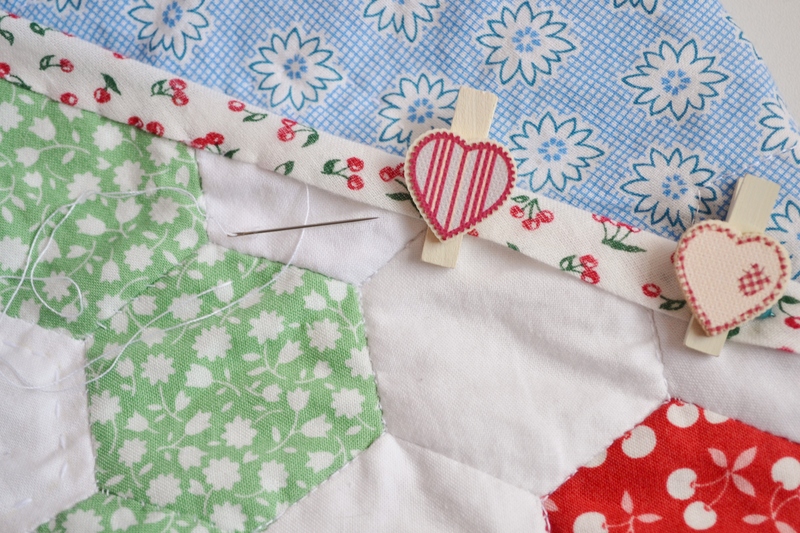 Now as you know I love hand sewing but hand quilting is a whole different story… I can officially say that blood, sweat and tears went into the making of this quilt! 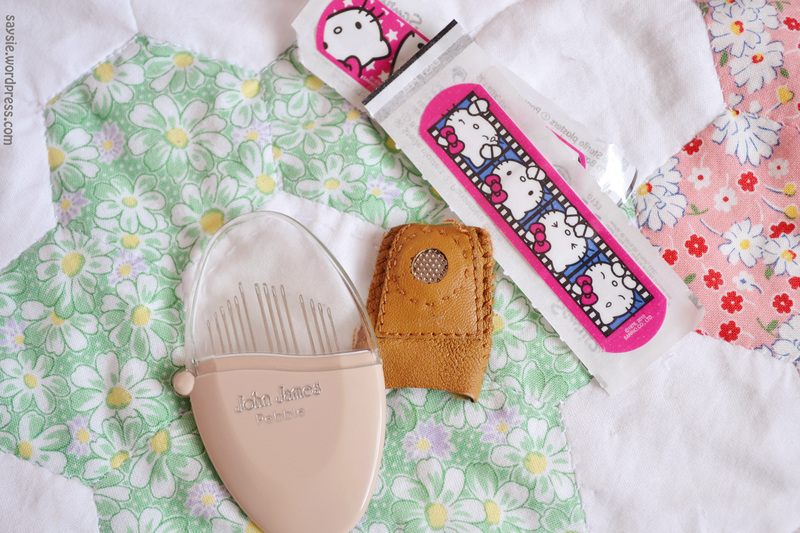 Before I started I thought I would be able to make do without a thimble and was using just a standard embroidery needle, but after several attempts I knew I had to rethink my kit. Luckily I remembered I already had some quilting needles and so out they came, I then went online to find myself some finger protection! It’s safe to say I got through a fair few plasters! I also ordered a hoop but didn’t get on with that so well. I was actually really disappointed about my attempts and how difficult it was, I had had visions of enjoying evenings of peacefully hand quilting the entire quilt, but it ended up being a workout and exhausting! I got to the point where I couldn’t wait to finish. Now I won’t say I’ll never hand quilt again but I think I will try on something a lot smaller like a pillow or something, the bulkiness of the quilt just made it very difficult. It was hard to get the stitches perfect and that frustrated me so much!! I’ve ended up doing a bit of machine quilting too as I just didn’t trust my hand stitches mainly because they look so tiny on the back side of the quilt. The thing with being self taught is I have no idea if I’m doing things right or wrong, it’s all trial and error! My mum has a C&G Diploma in Patchwork so she has been a huge part of my learning and is great at giving me little tips and tricks, but I normally only ask her after I’ve been struggling for a bit, so I should really learn to go to her sooner! I also need to learn not to be such a perfectionist when I’m learning something new, I can’t expect to be perfect first time, and when I do see pictures of beautifully hand-quilted items it’s most likely not their first time doing it and they have more than likely been doing it for a few years! I beat myself up so badly if I don’t do something perfect first time, not just in sewing it’s in everything I do. Time for the binding! This is slowly becoming my favourite part of quilt making, and now I’m so close to the finish line I’ll actually be sad to not have it to work on anymore, but it’ll be great to see it finally finished! I can’t wait to share the finished quilt with you all.